KCU student Andi Canhasi managed to escape from Kosovo during a dangerous time for Albanians. He now reflects on the fear he faced as a child, and on the hope he has for his future. “I can definitely remember being in danger,” he said. “I was separated from my mother and I vividly remember an armed solider yelling at me and pointing his automatic AK-47 in my direction." World Refugee Day is set aside to honor the courage and resilience of people who came to the United States fleeing persecution, conflict or natural disasters. Kansas City University of Medicine and Biosciences (KCU), is honored to have a former refugee who is making a difference among its students. Third year medical student Andi Canhasi fled his home in Kosovo when he was 10-years old. He remembers the day he realized his family was in trouble. Canhasi, now 29-years still has vivid memories of confusion and fear. “I can definitely remember being in danger,” he said. “I was separated from my mother and I vividly remember an armed solider yelling at me and pointing his automatic AK-47 in my direction. That was the first of many times I was threatened by members of the Serbian army. His own experience as a child refugee separated from his parents shaped his strong reaction to the current controversy over migrant children who are separated from their parents on the U.S. border. “I have only one comment: separating families no matter what the situation should always be considered immoral and wrong,” he said. Canhasi says his family is still grateful for the help they received from Catholic Charities and the people of Florida, who provided an apartment, job assistance and his first bicycle. “That was my entertainment for two or three years,” he smiled. Even though his father was not able to practice medicine in the United States, Canhasi dreamed of following in his footsteps. He worked 40-50 hours per week so that he could take a few college courses at a time. 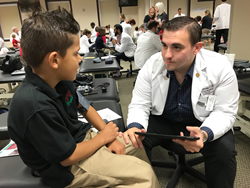 It took six years to complete his undergraduate work; he then earned a master’s degree in medical science at the University of South Florida in hopes of strengthening his application to medical school. All of those years of sacrifice and hard work paid off. Canhasi is now a medical student at KCU while working on an MBA from Rockhurst University as part of a dual degree partnership. Canhasi’s ultimate dream is to become an orthopedic surgeon. “I remain very determined to grow as a person,” he said with the confidence of a survivor. Canhasi has a message for Americans who only know of refugees through what they see in the news and in social media: “These people have escaped persecution and a harsh environment in their own country. That is why they dream of coming to the United States. Most are trying their best to survive in the United States and you would be surprised how much of an impact some decency and human kindness can have on their lives. They are extremely proud to be American! The day Canhasi arrived in U.S.